I know this may sound crazy, but, for writers, the benefits of boredom outweigh its downsides…. I hate being bored. To prevent the bleakness of boredom from descending on me like a grey fog, I have bought a digital subscription to the New York Times. 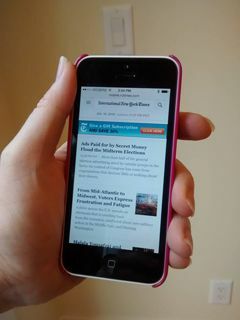 For just $16.80/month I can read the Times on my cell-phone, which I do, regularly. Standing in line at the bank. Waiting for a train. Sometimes, even, waiting for a stoplight — but only if the article is really, really good. That said, I never read or text while walking, especially not on streets with traffic. I may be bored but I’m not reckless! On the other hand, I may be crazy. It sounds as though I’m sacrificing some creativity in exchange for my own amusement. And, guess what? The participants who’d done the boring task first produced far more creative responses. It turns out that boredom is not just a troublesome feeling that we should avoid. It’s something we should embrace. And entertainers around the world know this already. Irish TV comedy writer and director Graham Linehan feels the same way as Cleese, but notice how he puts it. “The creative process requires a period of boredom, of being stuck,” he says. “That’s actually a very uncomfortable period that a lot of people mistake for writer’s block, but it’s actually just part one of a long process. “The internet has made it very difficult to experience that,” he adds. Isn’t it interesting how the digital world may be guilty of ramping up our need for amusement and squashing our ability to be creative? When I started writing 35 years ago, I used a pencil and paper and then proceeded to a typewriter. Rewriting anything was damn hard work, frequently involving scissors and scotch tape. Now, with my computer, I can use “move block” to transfer words in a moment or two. Easy-peasy. The research process has become equally facile. Just ask Dr. Google any question you like and you may get 21 million results in a few seconds. Here’s the real issue, however: When you’ve found that answer, can you stop yourself from following the breadcrumbs (IT people call them “hotlinks”) inevitably buried inside that article you really needed. Or, worse, can you prevent yourself from wandering over to Facebook or Twitter and, before you know it, discovering that you’ve used up half of your working day? The “work” of sitting at our computers and trying to prevent ourselves from being bored is really a form of idleness — masquerading as diligence. But idleness, per se, is not a bad thing. It’s good for us, argues Andrew Smart in his new book Autopilot: The Art and Science of Doing Nothing. “Being idle is one of the most important activities in life,” he says. Just be aware that when Smart uses the word idle, he means really idle. Not checking on our Facebook status or, reading the New York Times on the phone, like I do. He thinks we should get away from our desks more. Go for idle walks. Engage in hobbies we really like. Sit in coffee shops and drink coffee while listening to the hiss of the cappuccino maker (instead of using our laptop to get more work done.) Why? Boredom will come and go. When it’s there, don’t chase it away. Take advantage of it. And please excuse me while I cancel my subscription to the New York Times. Do you struggle with boredom? How does it affect your writing? We can all help each other so please share your thoughts with my readers and me, below. If you comment by October 31, 2014 I’ll put your name in a draw for a no-charge copy of the novel Boy, Snow, Bird by Helen Oyeyemi. If you don’t see the comments box, click here and then scroll to the end.